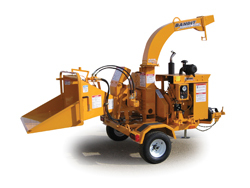 This chipper is a compact, easy-to-tow 6-inch capacity disc-style chipper. A 6 x 12-inch chipper opening allows it to process multiple stems as well as large diameter pieces up to 6 inches. It is equipped with a hydraulic auto feed system. Use only for green branches in chippers and no dry limbs, trash, or dirt. * Please call us for any questions on our chipper 5 inch tow behind rentals serving Baltimore and surrounding communities in Central Maryland.